then Masking fluid “painted”, then watercolors. I may have to do 100… such fun! 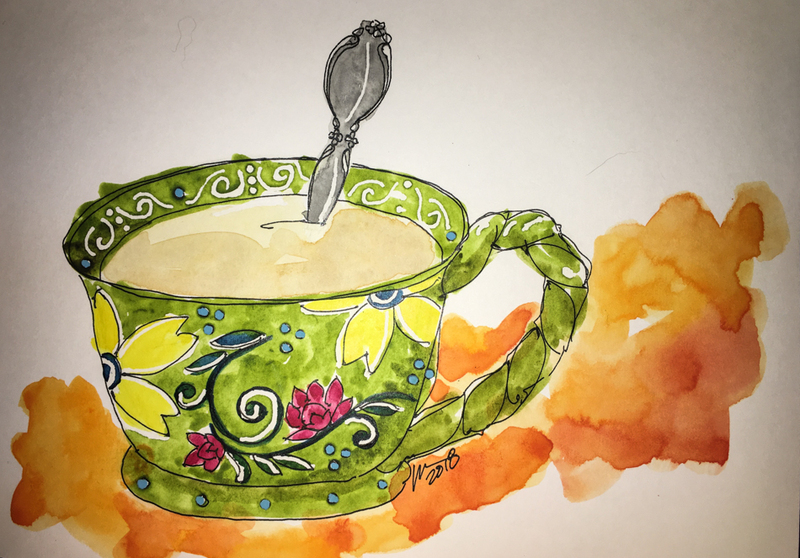 This entry was posted in art journal, journal, painting, pen & ink, series, sketchbook, watercolor, writing and tagged #brightwatercolors, #cuppa, #danielsmithwatercolors, #davinciwatercolors, #Hahnemühle, #holbeinwatercolor, #MGrahamwatercolors, #middleofthenight, #nostalgiejournal, Daniel Smith watercolors, Fineline masking fluid, Holbein, M.Graham watercolors, Nostalgie Sketch Book Journal, Primatek, Rose Dore, Sennelier, watercolor. Bookmark the permalink. How pretty! I love that green. The whole painting is wonderfully cheerful! Love it!! Please do more! Yes such fun! Love the design and colors! Thanks Marie! I enjoy the cuppa images too! So wonderful to meet you. I liked your art page and am going to watch some videos. I love how your cup turned out. Beautiful. Wow Katie these are fabulous!!! Well done indeed. What a lovely delicate painting! I adore your artwork–this one is particularly charming. Thank you so much… Feedback like that lifts the creative heart!